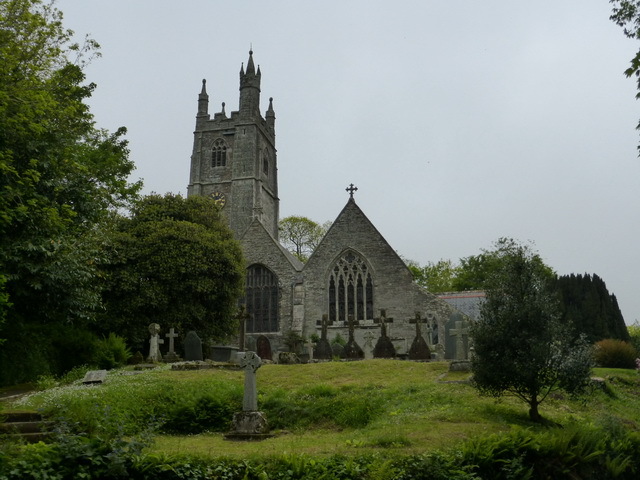 St Mawgan is situated in the lovely wooded Lanherne valley a stone’s throw from Newquay airport. This is a place steeped in history for the Arundell family lived in Lanherne house alongside the church. The church is high on a lan which looks as if it were carved out of the hillside. It has an odd layout: a nave, south aisle and north transept but with the tower effectively forming the south transept, close to the hill. 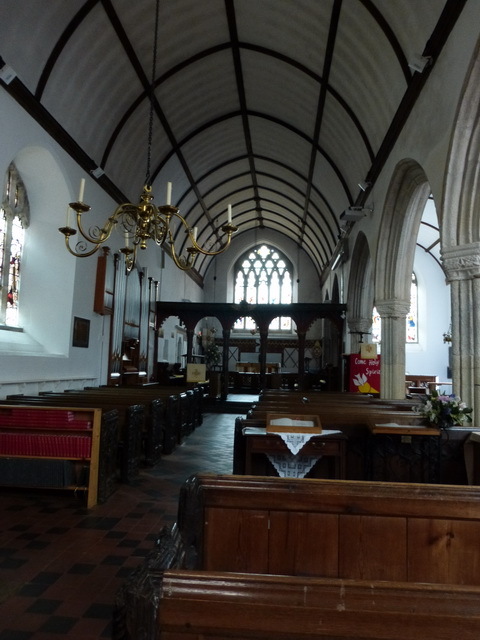 Inside there is a marked contrast between the nave and the south aisle. The nave is dark, constrained by a Victorian rood screen which, thankfully, has no screen beneath it, no doors to shut out the faithful. The south aisle is light, thanks largely to the large clear-glass west window. Close up, the rood screen turns out to be painted in vibrant Puginesque colours which are only revealed with direct light. On the congregation side, some chubby angels hold a shield of the Arundell arms. 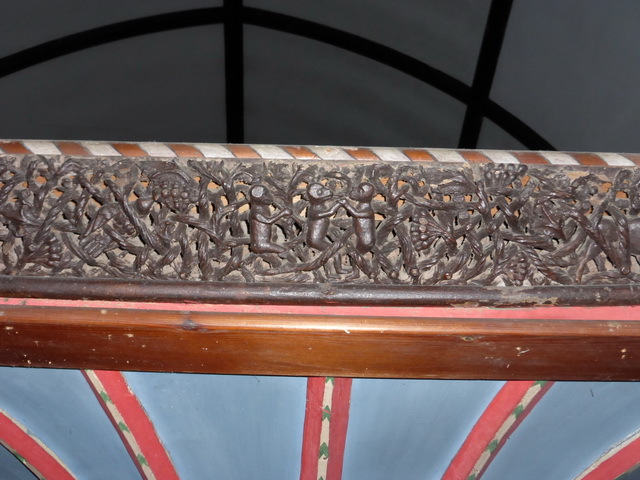 On the choir side, a recycled piece of traditional carving contains some charming monkeys hidden in the foliage. The re-use of old carving is typical throughout the church. There are over 50 bench ends which have been artfully incorporated into modern pews. Not up to Altarnun standard, they contain the ‘standard’ images of shields and the instruments of the passion. Around the altar in the south aisle are a series of lively brasses which have been re-positioned and explained. A former vicar has done wonders interpreting the coats of arms and their quarterings. 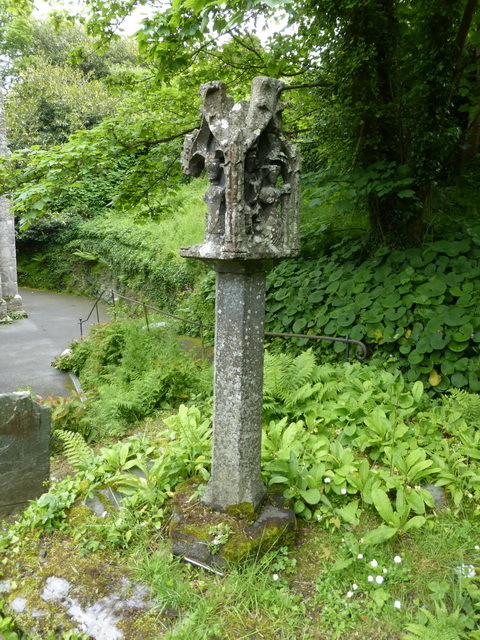 Outside, the glory of the churchyard is the C15 lantern cross – ‘one of the finest of its type’ – which bears symbols of the annunciation, the trinity and bishops. Close by are the headstones for the unfortunately named Crapp family and a modern memorial to ten sailors whose boat drifted ashore bearing their lifeless bodies after they had frozen to death in 1844. We left with the impression of a church which had been thoughtfully, if not wholly successfully restored – it is hard to forgive the darkness of the rood screen, open though it is – but there is much to look at and it is certainly a lovely, peaceful and wooded valley. As we left, we heard the bell from the convent in Lanherne ringing what must have been nones: a real sense of continuity.